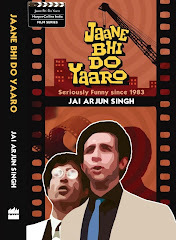 Starting next Friday, I’ll be writing a fortnightly film column for Yahoo India. This is part of a new section that has launched today, and which will feature many other columns on a variety of subjects: for the full list, see this post by Amit Varma, and also see the first edition of Amit’s column Viewfinder. And I will, of course, post my columns on Jabberwock as they appear. Excellent work, Jai. All the best. Apropos film, did you see today's article in the Independent on the restoration and screening (in 2012) of some of Hitchcock's early silent films? There's a good reason for you to nip over. I couldn't find an RSS feed on the Yahoo India site. Is there one? If not, can they make one?